Lifetime Portable Basketball systems can be found in almost any neighborhood - and for good reason. Lifetime basketball systems dominate the industry with unmatched high-quality, professional like performance, and great style. 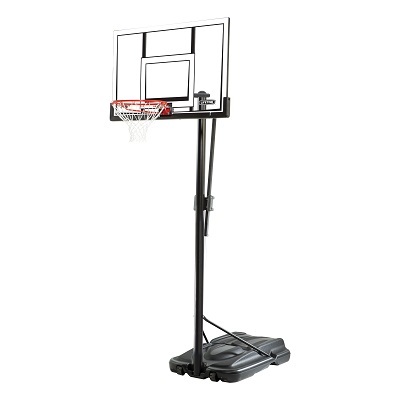 This portable basketball system has a large 52 inch backboard allowing for most bank shots. 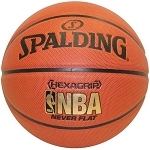 It adjusts very easily to allow children and grandchildren to play with regulation size or many basketballs. enjoy the game in the comfort of your own driveway with family and friends. Whether you are playing a serious game, playing horse, or just shooting around, this portable system will allow you to get the blood flowing and to get some exercise while having fun. Extension Arm Type: (the arms that attach the backboard to the pole) Rigid arm assembly allows for extreme stability. UV Backboard Graphics:Yes. Ensures graphics and borders won't fade over time. Backboard Frame Pad:Includes backboard frame pad to help protect players from impact. Regulation-size rim (18" diameter). Uses a regulation size NBA basketball or smaller. Dunking: Yes. This rim holds up very well to aggressive play. Net included: Yes. Net is a heavy-duty 80 gram 12-loop net. 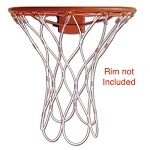 Net attachment: Attaches to rim via welded metal hooks like in the NBA. No plastic clips. Height Adjustment Type: Uses the Front Adjust height adjuster invented by Lifetime Products. Adjustment Details: Front adjustment has a handle. Grab handle with two hands and simply push up or down to desired height. No tools needed. Rim Adjustment Heights: 7.5 feet to 10 feet in 6 inch increments. Pole Diameter: 3-sections, 3.5 inches round with pole cap to prevent rain in pole. Pole Material: Steel with powder-coated finish to prevent rusting. Pole Pad: Sold Separately Part # 0602 Click here to view 0602. Anchor Kit: Not necessary. The pole on this system goes directly into the concrete. It does not bolt down. Fill Material: Fill with water or sand. Fill plug on top and drain plug on side of most models for portability. About 50% of water may be drained to easily move around. Replacement caps available through the manufacturer's customer service. 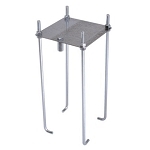 Footprint:The average portable base footprint is about: 4' deep, 2.5' wide, and 9 inches high. Warranty: 5-year warranty on all parts of the system from Lifetime Products. Q: What are the differences between What is so great about the front adjust mechanism? A: What are the differences between What is so great about the front adjust mechanism? Q: Can my kids dunk on this? A: Can my kids dunk on this? Number of boxes for this product: 1 box. Ships via: FedEx or UPS. Doorstep delivery. No signature required for most residential addresses.